The Chicago Force reflected once more on its memorable 2012 season that ended with a national championship game loss to the San Diego Surge Aug. 4 at Heinz Field in Pittsburgh. 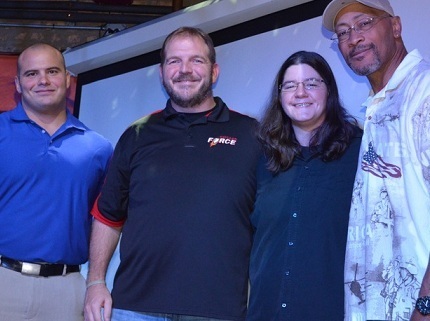 The Force held its annual awards banquet Oct. 20 at Spin Nightclub in Lakeview, with more than 100 attending, including players, coaches, staff, family and friends. "It was a phenomenal season, with everything but the storybook ending," Force owner Linda Bache said. "We were so close [to winning the national championship], so that leaves mixed emotions [about the season]. We were one of two teams that got to play at Heinz Field, with a live broadcast on [an] ESPN [station]; that was amazing. There are 60 other teams that wanted to be us. The fact that we lost in the last minute is kind of hard to live with, but serving as motivation for next year." The Force lost to San Diego 40-36. "This [banquet] is the first time we've had the team together since the season ended, so everyone is excited to see everyone. It's like a family reunion," Bache said. "We had a lot of great players and an amazing season. There were a lot of worthy performances this season. I have a team with second-string players who would be all-stars on other teams; that's a fact. There's an abundance of talent." So any predictions for 2013? "Yes, we're back in the championship [game,] Bache said. "That's the goal and I feel great about it."